Well, I don’t really have any good reason for my recent hiatus, and it’s true that I’ve been cooking less often at home. But with the holidays and lots of family events recently, I’ve still been cooking in other people’s kitchens a lot. For my mom’s birthday this past weekend, my brother and I decided to make dinner at home since my parents were returning from an out-of-town wedding. She requested something on the relatively healthy side, and since I had all my parents’ cooking appliances at my disposal, I decided to make use of them. 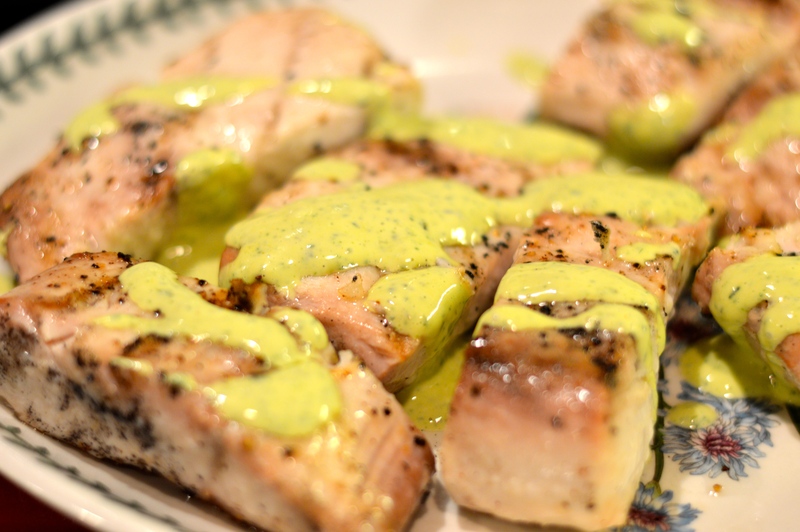 I decided to do a grilled fish on the Big Green Egg with a basil aioli made in the food processor. I also stumbled across an interesting and easy-looking recipe for braised leeks in white wine, so we had those and a salad that my brother made as sides. My original recipe inspiration for the fish called for swordfish, but unfortunately, there was none to be had at Publix – I guess they didn’t know it was my mom’s birthday. I picked the next meatiest fish they had, which was Mahi Mahi – if you’re grilling fish, you want one that is dense and thick. Really thin filets are much more difficult because they stick to the grill, fall apart, don’t want to flip or just overcook too easily. This meal didn’t take a super long time to prepare, but I was actively cooking from start to finish; it was a little on the labor intensive side. It was worth it, though, when the meal turned out well and we got to enjoy it as a family. I’ve included the fish and aioli recipe below, and the leeks will come later! Heat grill to medium-high for the fish. Brush the fish with oil and sprinkle with salt and pepper. 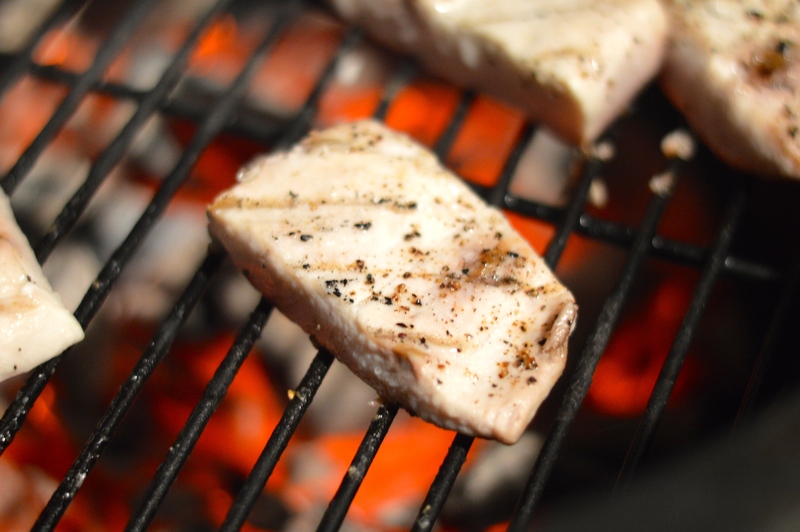 Place the fish on the grill and let it cook untouched for 3-4 minutes. Flip the fish once, using a thin metal spatula and sliding underneath the filets parallel to the grate of the grill. This will help keep your fish intact and give you nice grill lines. Remove from the grill and let the filets rest. 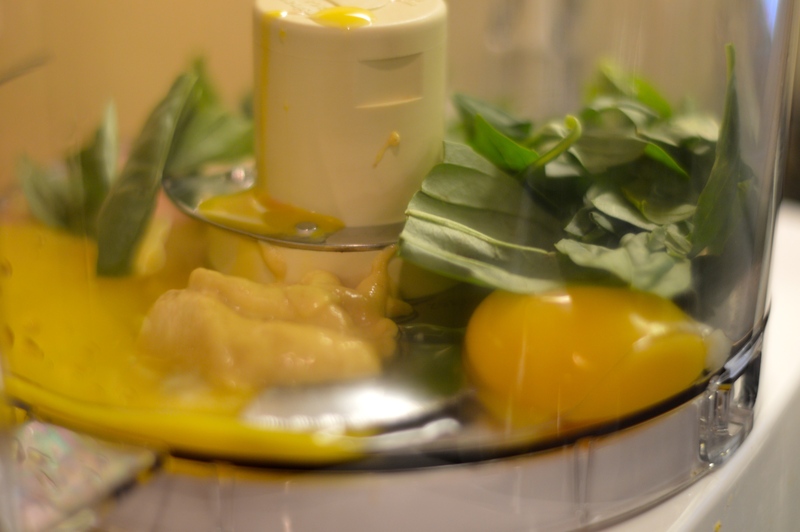 To make the aioli, combine basil leaves, mustard, egg yolks, lemon juice and salt in a food processor and pulse until well-mixed. Turn the processor on and pour a slow stream of canola oil into the mixture. Once the canola oil runs out, add the olive oil the same way until you get a thick, creamy, bright green aioli. Add additional lemon juice to adjust taste and/or thickness. Drizzle aioli over fish and serve.